The day was not one of content and ease. The trees, young and old, slim and stout, were in constant peril, their limbs blown in e'ry direction. Any stubborn, fool-hearty leaves still clinging onto their perch were ripped from, and thrown into the swirling winds. A tempest was waged. The great-grandson of Poseidon, Mousamus was not pleased. The night before found Mousamus cocked from six Preludes and three Velvet Elvises. A fair mermaid he had spied across the sand bar. The mermaid flashed her jewel-eyes and whipped her hair this way and that, while Mousamus watched, unable to move beyond the repetitions raising his glass to his mouth and a blink every few moments. A fair mermaid he had spied across the sand bar. The great Poseidon himself was at this sand bar on this night as well. Chuckling to himself, he rose and took seat next to his great-grandson. Another minute would pass before Mousamus knew the great Ocean God was near. A mixed jumble of nervous words confirmed the grandson's intoxication and Poseidon then rose, and, placing a hand on his kin's shoulder, said, "She's looking at you for a reason, son." Mousamus turned slowly to catch eyes with the wise God. And then Poseidon was gone. Mousamus looked into his drink and a strength came over him. He took another look across the sand bar at the sea sprite, then finished the last two swallows of his brew and rose. He shook his head to clear it of the cobwebs and cleared his throat as he walked toward the maiden. Noticing him approaching, the mermaid quickly turned away, then back again, nervous and anxious for the conversation that would soon follow. She flipped her hair over her shoulder and turned as the kin of Poseidon neared. Four strides from the beauty, Mousamus' step went amiss. He had forgotten about the two stairs that separated the sand bar's stools and the floor below. Expecting ground and stepping onto nothing, the young God's footing was lost, his body now in an irreversible downward fall. 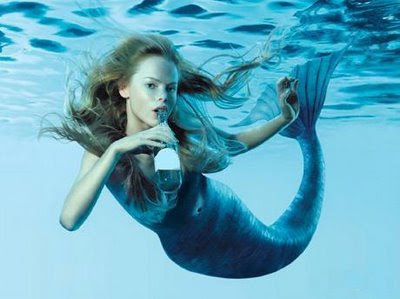 He hit the floor shoulder first and remained in a defeated collapse at the foot of the young mermaid. She looked down at him in his drunken stupor, shook her head in disgust then smiled and laughed and left the sand bar. Mousamus watched from the floor as the sea sprite walked out the door. A roar of laughter from the bar erupted as the lady left. The sand bartender chuckled softly and shrugged at Mousamus when he looked up. Far away in another sea, great Poseidon laughed and shook his head. Every soul in the sand bar laughed. Except for one. Mousamus rose with the fury of a tidal wave, grabbed the nearest sand bar stool and with one hand threw it across the bar. Laughter ceased. He spun 'round the room, nearly falling down again before tossing three empty pint glasses off a table, pushing the table over and exiting the sand bar. A tempest he would make. Winds came, raising the seas to eighteen feet, crashing upon the shores. Trees snapped like twigs, were ripped from their roots like sea grass. Mad currents of fury spun through the sea, shooting the salty ice water into the air. A tempest he would make. And with the piercing wind came the rains of defeat. Pounding rains, vertical, horizontal and angled, unleashed upon the land below. Swelling the rivers and flooding the lands, Mousamus waged on. The highlands saw snow, the coast, slush-rain. Working himself to complete exhaustion, the young God finally found his slumber. Swelling the rivers and flooding the lands, Mousamus waged on. 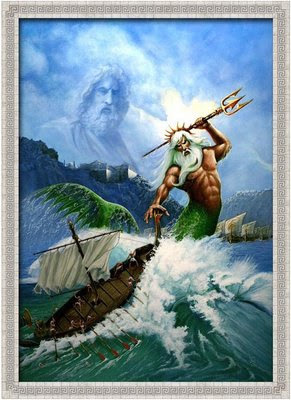 Great Poseidon watched his grandson and did not interfere. The next morning the skies were still grey. His head feeling somewhat similar to the disaster which lay 'cross the land before him, Mousamus' mood was barely improved. Tired from the storm, but still angered, Mousamus kept the skies a dark grey. Rain and snow sporatically peppered the sky as the day turned into afternoon, the sun falling in the sky. A lone warrior entered the terrain below as Mousamus lay in bed. The warrior inspected the waters Mousamus reigned over. They were wild and still furied. Poseidon himself took note of this warrior and watched with one eye. Stepping into the turbid waters, the warrior intended to angle. Stepping into the turbid waters, the warrior intended to angle. Searching the waters, the warrior's efforts were made difficult by the raging water. Slower, slack water focused his attention as he worked his flies. Drifting, stripping, watching, the warrior observed the rushing water and the slower currents that formed along the banks of the swollen river. Poseidon and Mousamus separately watched the mortal in silent interest. Poseidon commended the warrior's resolve and rewarded him with a hungry fish. Feeling the strike, the warrior instinctively raised his rod, setting the hook into the trout's lip. A battle cry unleashed, the warrior was in full form, chasing the fish beast down stream, all the while avoiding the branches and rocks that were usually not under water. Mousamus did not share the same sentiments. This angler warrior would not touch this fish without a struggle. A wind he made and the warrior found his battle suddenly more difficult. And then, his foot mis-stepped and he stumbled, staggering backward into the bushes behind. Mousamus chuckled as the warrior found his fishing line now tangled in a tree, and a bush of thorns wrapped 'round his hand. Cursing, the warrior rose from his stumble and yanked his hand from the thorns. Three thorns remained stuck in his fingers. With vicious quickness the warrior took hold of each thorn with his teeth, removed them and spit them into the river. Juding the line tangle to be only moderate, a quick yank removed it from the tree. And lo, the fish beast remained on the line. Mousamus cursed. Poseidon smiled. Soon the fish beast was brought to the warrior's fish net. Poseidon giveth a fish beast. Mousamus groaned, rolled over in his bed and returned to slumber. Poseidon however was more intrigued by the angling warrior. He watched as the mortal contined his piscatorial pursuit. Poseidon again giveth, granting the warrior with another, larger brown trout. The mortal crossed the river and bushwacked into a prime location. Poseidon smiled yet again, and giveth. A third fish beast was brought to the net. A third fish beast was brought to the net. Evening overtook the light and the warrior of the angle departed the waters of Mousamus bound for his homestead. As the waters were almost out of view, the warrior turned back and thought he spied the flash of hair and wink of a sea sprite, but he may have been mistaken. as we have witnessed on countless accounts, the great posidon both giveth and taketh away. its always a wild day of fishing when this mighty being finds interest in your pursuits. one of these days that sprite will show her face, and you will both chuckle. Tremendous story Jesse. I was greatly entertained. I will call you tonight to discuss future social endeavors. Confirmed. This is my favorite blog post of all time.